Differentiation of Streptococcus pneumoniae from other viridans streptococci depends on demonstrating optochin susceptibility, bile solubility, reaction with a specific DNA probe, or detection of species-specific capsular polysaccharides. Most clinical microbiology laboratories today depend on the optochin susceptibility test. Although optochin susceptibility was first described for differentiating pneumococci from other α-hemolytic streptococci in 1915, the test was virtually unused by laboratories until the mid-1950s. Optochin is a chemical, ethylhydrocupreine hydrochloride and is completely soluble in water. It is useful in the identification of Streptococcus pneumoniae, the alpha-hemolytic Streptococcus most commonly susceptible to this chemical. Other alpha-hemolytic streptococcal species are optochin-resistant. This test determines whether the bacterium is either sensitive (susceptible) to optochin or resistant to the chemical. The optochin test is widely used in the form of filter paper discs, impregnated with ethylhydrocupreine hydrochloride, which are applied directly to inoculated plates before incubation. The optochin test is less time-consuming than the bile solubility test. To determine the effect of Optochin (ethyl hydrocupreine hydrochloride) on test organism. A positive presumptive identification of S. pneumoniae is made when a well defined zone of inhibition results around the impregnated disk. Other alpha-hemolytic streptococci do not display this clear zone of inhibition when in the presence of optochin. The chemical tests the fragility of the bacterial cell membrane and causes S. pneumoniae to lyse due to changes in surface tension. Using an inoculating loop, select three to four well-isolated colonies of the alpha-hemolytic organism to be tested. An 18-24 hour culture of isolated organism can also be used for testing. Streak the isolate onto one-half of a TSA-5% sheep blood agar plate so as to obtain confluent growth. Important : Use of media other than TSA-5% sheep blood agar is not recommended, as false identification may result. Using sterile forceps, place an optochin disk onto the inoculated surface of the agar. Press disk gently with the sterile forceps or loop so that the disk adheres firmly to the agar surface. Incubate the plate at 35 +/- 2.0 degrees C. for 18-24 hours in 5-10% CO2 enriched environment. If zone of inhibition is present, measure the diameter with a millimeter ruler or caliper. 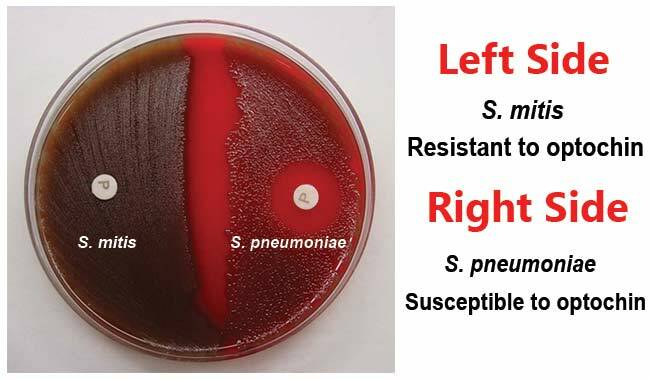 A presumptive identification for S. pneumoniae can be made if the alpha-hemolytic colony produces a zone of inhibition of 14mm or greater around the disk. Organisms producing smaller zone sizes should be tested for bile solubility. Organisms with questionable zone sizes (6-14mm) around the disk should be presumptively identified as a pneumococci only if it is bile soluble. Positive Test: Zone of inhibition is 14 mm or greater in diameter with 6 mm disk. Negative Test: No zone of inhibition or a zone of inhibition of <14mm diameter. Positive: Streptococcus pneumoniae (ATCC ® 6305), S. pneumoniae (ATCC 49619). Negative: Streptococcus pyogenes (ATCC ® 19615), S. mitis (ATCC 49456). Optochin lyses pneumococci (positive test), but alpha-streptococci are resistant (negative test), thus aiding in its identification. It has been shown that other strains of alpha-hemolytic streptococci may show a slight susceptibility to optochin. Optochin susceptibility is a presumptive test only. It is recommended that further biochemical tests be performed for complete identification. Many isolates will show indeterminate zones on media other than TSA-sheep blood agar. Isolates showing the indeterminate zones would require further testing to identify them as S. pneumoniae. S. pneumoniae isolates should be incubated in a CO2 enriched environment, as some isolates will grow poorly or not at all aerobically.